Take your love of shared adventures further, discover Nordic Tugs today. To understand Nordic Tugs trawlers, a good place to start is with our owners who are experienced mariners. Most Nordic Tug owners have already owned a sailboat and or even a powerboat, but all owners have a clear idea of what they value in their ultimate cruiser. After all, our owners spend twice as many hours on the water each year compared to the average yacht owner. Some of that has to do with the comfort, fuel-efficiency and sense of community, but mostly it comes down to quality of life. Our owners have it. 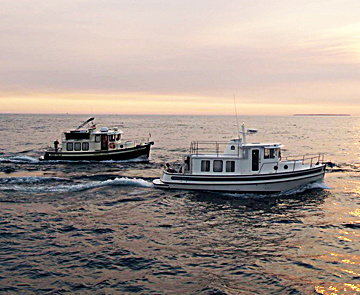 Nordic Tugs owners are invariably energetic, enthusiastic and passionate about life and sharing adventures on the sea. At Nordic Tugs, the emphasis is always on quality over quantity. Each vessel is inspected at every stage to ensure it meets our stringent requirements for performance, durability, comfort, silent operation and fuel efficiency. Over 120 components and processes are monitored on the hull and deck before the two parts are ever bonded together, and this is only the beginning of Nordic Tugs’ quality assurance. Only after the entire boat has been checked and all systems have been run-up at the factory does it have a chance to prove itself at sea. A Nordic Tugs’ test crew puts every boat through an extensive protocol of tests and maneuvers in multiple sea conditions to ensure the highest quality standards before it is returned to the plant and prepared for delivery. During our day-long sea trials, we put the boat through its paces — cruising at various speeds, executing quick turns and making sudden accelerations and decelerations. Armed with testing equipment from decibel and infrared meters to anemometers, our knowledgeable sea trial team ensures that all systems are operating correctly and makes minute adjustments to ensure that the boat you receive is turnkey and ready for cruising. It is the kind of quality you rarely find in production boats — a quality we confidently back with a full 10-year hull warranty. Every handcrafted Nordic Tugs boat begins with thoughtful design, from fiberglass components engineered for added strength and safety to a spacious engine room with systems that are easy to access and clearly labeled. We understand that quiet operation and freedom from vibration is important to you. Noise reduction is designed from the keel up and is never an afterthought. At the dock or offshore, you will notice the skill that is applied in the assembly of every component of your Nordic Tugs trawler. 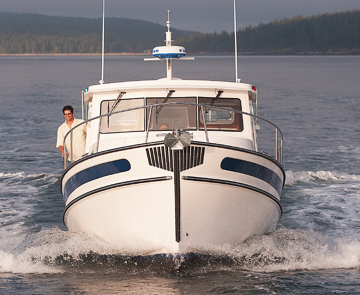 Confidence comes naturally when cruising in a state of the art vessel. Designing the hull for a cruiser or trawler is a delicate balancing act. You want a design that offers stability both for comfort and safety, adequate speed so you can get to your destination and have time to enjoy it. Add fuel efficiency into the perfect cruising formula so you can explore without worrying about the next fuel stop. At Nordic Tugs, we have met this challenge with our unique semi-displacement hull, designed to meet the demands of serious inland and coastal cruising. At low speed, it conserves fuel and reduces roll. At high speed, it rises up to reduce drag. A versatility that neither a full displacement nor planing hull can match. The unprecedented structural integrity and reliability of our hulls allows us to provide our customers with a 10-year warranty against both structural failure. Every Nordic Tug is born in the U.S.A. and is brought to life by a dedicated long-term work force in a clean and healthy environment. Our 80,000-square-foot facility was purpose-built in 2007 and expanded over two buildings in 2014 exclusively to produce Nordic Tugs. Creating a new facility instead of retrofitting existing buildings allowed us to design specific to our own process, without having to make a single compromise — all our buildings give workers the space, lighting, superior ventilation and equipment they need to ensure that your boat is built and assembled with the utmost care and quality. 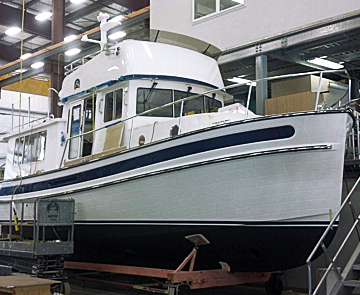 The factory is equipped with four five-ton hoists, and its modular design allows us to accommodate any size Nordic Tug that is required — with room to build up to 17 boats at a time. 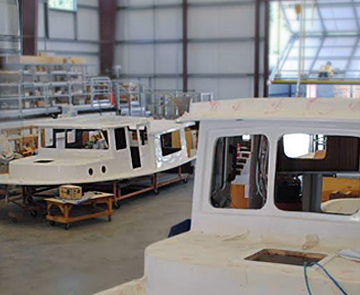 Thanks to these factors, along with strict environmental compliance, our factory is acknowledged to be the premier boat-building facility in the Pacific Northwest, exceeding EPA emissions compliance standards by a wide margin. Some 1,200 to 1,500 parts go into each Nordic Tug, and each part is carefully chosen for its durability, performance and aesthetics. We use only multidirectional stitch mat fiberglass cloth and a special vinylester resin for added strength, durability and resistance to osmotic blistering. 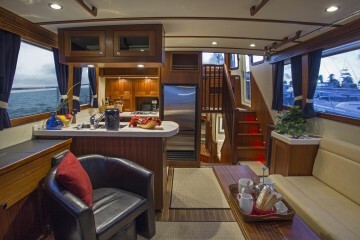 Stainless steel reinforces critical areas such as the shoe and rudder support on the keel. The hull and deck joint as well as the bond of all major laminated components is fiberglass reinforced for maximum strength. Wires and cables are marine grade tinned-copper for a lifetime of trouble-free operation. 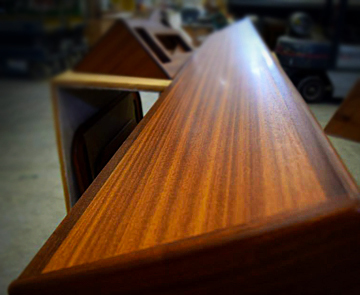 Finishing materials like solid hard woods, hand-picked to match grain, add elegance to the interior. From soles to salon roof, Nordic Tugs are built for years of reliable service so you and your family can go where you want, when you want, and know that your boat is ready and waiting for the next journey. The idea that grew to become today’s Nordic Tugs had its origin in the fuel crisis of the mid-1970s: build a fuel-efficient vessel that combined the attributes most important to the cruising boater. It proved to be one of those rare ideas not only appropriate for its time, but an idea whose virtues are more relevant today than ever. Our story begins in the early `70s, when Jerry Husted purchased Blue Water Boats, a company that manufactured ocean ketches of the Norwegian “Ingrid” design, from Jim Musser. Musser introduced Husted to Lynn Senour, the naval architect who designed the interiors and rigs of Musser’s boat. That combination of circumstances proved auspicious. The early `70s were plagued by oil shortages and high gas prices. Both Husted and Senour felt there was a place for a fuel-efficient powerboat. However, they had a hard time coming up with something original. It came to Husted in a flash of inspiration: a tugboat! Women would see it as cute and men would see it as rugged. And a tug looks good and is efficient going slowly, so people could save fuel. Lynn Senour tentatively agreed to jump into the project under the condition that he could do what he wanted under the waterline; namely designing a semi-displacement hull that balanced speed with fuel savings. 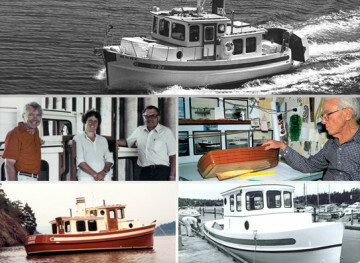 In 1979 Nordic Tugs, Inc. was born. Lynn Senour got to work drawing the first Nordic Tug, a design that paid homage to the tugs of the 1930s. The appearance of the new Nordic Tug 26 prototype at the 1980 Seattle International Boat Show caused a frenzy of excitement. With an introductory price of $29,995 and a reserved spot on the production line available for a $1,000 returnable deposit, buyers couldn’t help themselves. Thirty-seven (one every three hours) were sold at the show, with a total of 54 boats sold by the end of that month. Proving that imitation is the sincerest form of flattery, two competitors — Sundowner Tugs and Lord Nelson Tugs — launched their own pleasure tugs at the following year’s boat show. Interestingly, in the early days about half the boats were sold as workboats. “They were considered kind of like a pickup,” Husted explained. The most recent and perhaps last Nordic Tug workboat (a 26) was sold in 1992 to Pacific Gas & Electric for transporting work crews through the rough waters of San Francisco Bay. Nordic Tugs went on to build two versions of the original 26’ design. 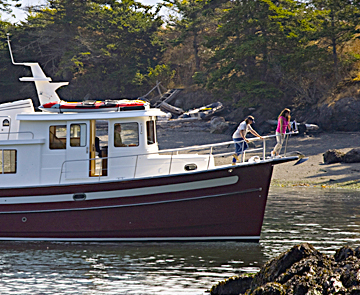 A cruiser, originally named the Red Apple, and the Cricket, a short cabin/open-aft deck model used primarily as a fishing vessel. The two boats were presented at the Oakland Boat Show where over 18,000 people stopped by to check out the newest boating sensation. The stylish, well-built boats with their fuel-efficient design and flexible cruising speeds proved to have lasting appeal. Eventually, Nordic Tugs expanded its product line to include a 32’ boat (1985), 37- and 42-foot models (mid-to-late `90s) and a 52-footer (2003). These models have since evolved to become the Nordic Tug 34, 39 and 54 with integrated transom platforms and fresh interiors. The Nordic Tug 49 was added to the line-up in 2009. With demand increasing for larger vessels, the Nordic Tug 26 was retired in 1997. The Nordic Tug 26 nevertheless retained a near-cult following and it was re-launched in 2009 as a limited production model. With the popularity of the tugs growing nationally, the original production facility in Woodinville, WA, reached capacity. 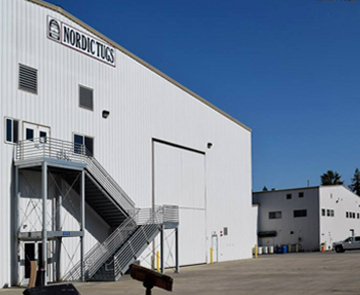 In March 1990, Nordic Tugs moved its plant and corporate offices to Burlington, Washington, doubling the production area to 15,000 square feet and providing for separate fiberglass lamination and carpentry shops. By 1998, Nordic Tugs moved yet again to a larger facility in Burlington to keep up with demand. The company expanded at that site in 2007, and in 2014 Nordic Tugs occupied an 80,000 square-foot two building facility that includes state-of-the-art manufacturing and environmental compliance equipment. 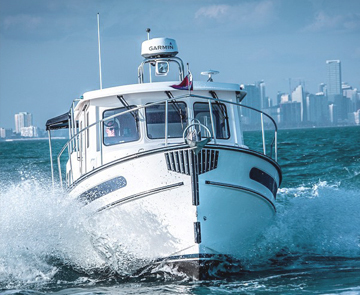 In 2007, Nordic Tugs received National Marine Manufacturers Association (NMMA), American Boat and Yacht Council (ABYC) Certification for its entire product line — an important distinction in the marine industry. While all boats in the United States are required to meet U.S. Coast Guard regulations ABYC certified boats must meet more comprehensive standards and pass a rigorous third-party inspection to ensure that construction adheres to all of the applicable standards. With interest and inquiries increasing worldwide, Nordic Tugs applied for and received Conformité Européenne (CE) Certification in 2007. The United Kingdom received the first exported Nordic Tug, a 37. Today, Nordic Tugs are exported worldwide, and the company has added dealers in Europe and Asia to meet international demand. 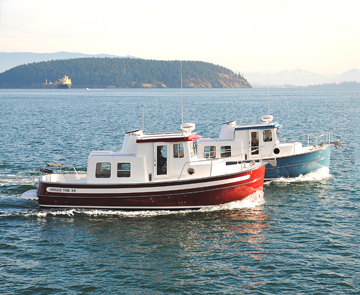 Husted and Senour combined features most important to the efficient performance and comfortable livability of a trawler, and in the process, developed a completely new category of cruisers. Nordic Tugs’ classic designs have withstood the test of time, and with continuous innovation in performance and livability, will continue to do so.